obtaining new actives and starting industrial exploitation of new deposits and in terms of assessment of the cost of the deposit exploitation together with the supposed participation in the development of transportation schemes shared with other deposit exploiters. The geoinformational system is realized by means of Arc View 3.3 . Thanks to the well-developed functional ability of geoinformational technologies it can be easily integrated into the existing informational system of the company. The system represents the existing and the planned nodular and communication infrastructure of the pipeline, railway and water (internal and offshore) transport of oil to the inner and outer markets, it also represents the infrastructure of oil processing within the territory of Russia and of 48 neighbouring countries. The information includes the data of the participants of the oil market, the extent of the oil processed and exported for the years 2002 – 2004. The characteristic of the main pipelines has been verified by the experts of “Transneft”. 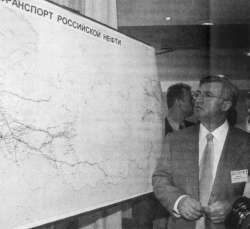 S.M.Vaynshtok is studying the map (photo of “Vedomosti”). The objects represented on the map and in the geo-informational system characterize possible ways of transporting Russian oil to the consumers. Tank sea and river oil loading terminals – 29 in Russia and 108 abroad. 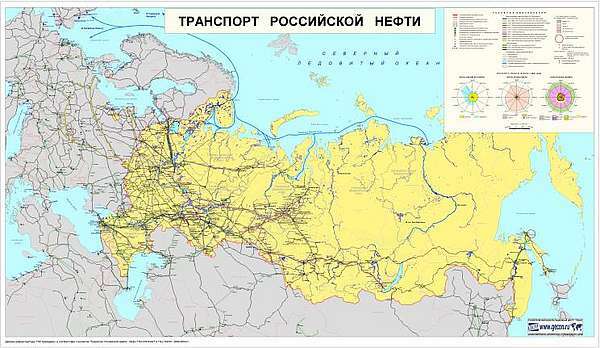 Areas of oil production on the Russian territory and in the neighboring states are given. Off shore ways of oil transportation, including the schemes of export by the North Sea Route and by other existing and planned routes escaping the system of main pipelines of the joint-stock company “Transneft” are indicated. The limiting conditions of the water transportation of oil: the ice schedule, the tank carrying power limit, the seasonal limitations of transportation and production – are indicated. Wall laminated map, its scale is 1:6 000 000, the size is 180×90 cm, the price of the map is 21,000 RUR. Atlas, sheet size A4, the price of the atlas is 15,000 RUR. Basic geoinformational system, the volume is 70 megabyte. The price of the system and its technical provision is 420,000 RUR. The planned infrastructure of the export of oil from the West Siberia to the shores of the Barents sea, to the eastern regions of Russia; past the strait Bosporus. The location of the regions of production enterprises, the extend of production, the directions of export, etc.